By offering an exclusive range of Radial Ball Bearing, our manufacturing, distributing, and exporting firm has emerged among the quality bearing provider in the domain. 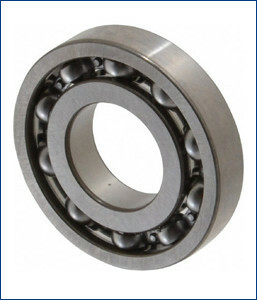 This bearing is used for manufacturing automotive products, precision machinery and parts. The offered product is designed and manufactured by utilizing superlative quality steel and sophisticated methodology under the stern guidance of our ingenuous professionals. Moreover, the provided bearing can be availed according to the specifications provide by the clients to us. Designed for better life in contaminated environments. Special coatings provide for additional corrosion resistance. Special seal designs help keep lubrication in and contamination out. Snap ring grooves are available to simplify mounting. Various seal and shield configurations, which help protect internal bearing components and retain lubricants, are available to suit a wide array of applications.